I love making pie, and I really do think it’s easy. Dessert pies are nice, but in my opinion, savory pies are where it’s at. I started making savory pies many years ago when I became obsessed with spinach pie. I don’t mean spanakopita, which is a particular, and, IMHO not the best, kind of spinach pie. The problem with spanakopita is the ratio of dough to filling – because the dough is flaky phyllo, it’s not very substantial and it falls apart halfway through eating a piece, so you end up with large chunks of spinach and feta filling, which are usually not good enough on their own to be interesting, or have an unpleasantly stringy texture. Most other eastern Mediterranean cuisines have a variation on spinach pie that involves a much thicker and sturdier crust, which I think makes them more satisfying. Once I got to a spinach pie I liked enough, it was a quick adaptation to other kinds of fillings. 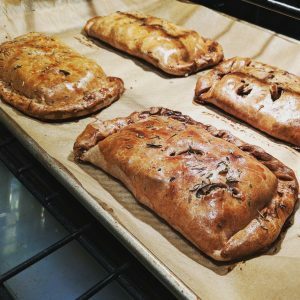 Because I’ve been told repeatedly to make freezer meals for after I give birth, I decided to make some savory hand pies that would work well as one-handed meals. The filling for this particular version is a milder take on chana aloo, my favorite Indian dish (that is shockingly hard to find at a lot of restaurants). I made it milder by reducing both the spice and the onions in the dish, since both set off acid reflux and I don’t know how sensitive my stomach will still be after I give birth. The combination of chickpeas and potatoes makes for a mild and comforting, but still interesting, meal that is incredibly satisfying. I also threw some kale in there to make sure there is a little more redeeming nutritional value. As with anytime I cook with kale, I added nutmeg to the spice mix, which I think helps to round out the bitterness and bring out the sweeter and nuttier side of the vegetable. Finally, in an effort to use up some teff flour from a failed gluten-free cracker experiment (for a friend who has celiac disease), I added a good portion of the rich, nutty flour to my usual pie dough mix, which made for a more tender and flavorful crust. The filling for this pie could be eaten as-is with some rice or bread. The cooking process creates a small amount of thick gravy, which you could bump up by adding more water/stock if you’re not making it into a pie – for the pie, you want less moisture so it doesn’t all soak into the crust. It’s definitely a major extra step to cook it into a pie, but that being said the hand pie medium is really wonderful and I think worth the effort. The dough comes together extremely easily – I mix it by hand, but it would take about 30 seconds in a food processor. The only part of this recipe that requires any real effort is rolling out the dough, and then only because it takes a lot of practice to reliably make even rectangles. But you could simplify that process by rolling out one large slab of dough and cutting circles (using cereal bowls as a guide), or even cutting rough squares, placing them in muffin cups, and topping them with a second piece of dough. The point is, there’s a lot of leeway to the shaping of these pies and I just happen to like the large rectangle shapes the best. The filling is vegan, but the dough is not. I am thinking about how to make a vegan crust that would be appealing in the same way – vegetable shortening in place of the butter would work, but I think for this particular dish, coconut oil would be better. Olive or canola oil would be nice in theory, but create a different texture – however, I could potentially make something a little closer to a traditional phyllo, by making the dough itself without any fat and then rolling it out into paper thin sheets and layering it with oil in between. I think that would be a nice product, but it requires a lot of work. As for the egg white in the dough, it would be easy to replace that with a few tablespoons of aquafaba, the liquid that canned chickpeas are packed in – the point of the egg white in my dough recipe is to add more protein and some liquid that is not water so that the starch in the flour doesn’t puff up as much, and aquafaba, which is often used as a vegan substitute for egg whites, would be perfect in this case. Drain and rinse 1 can of chickpeas and set aside. Chop 1 small onion finely (you want about 1/2 cup chopped onion), 1 medium russet potato into 1/4″ cubes, and half a bunch of kale (about 8 stalks, including stems) into 1/4″ x 1″ strips. In a medium saucepan over medium-high heat, add about 2 tbsp olive oil and sautee the onion until just starting to brown, then add a large pinch of salt, 1/8 tsp each turmeric, cumin, nutmeg, and paprika, and 1/4 tsp each coriander and Italian herbs (or another mild herb blend, or even just some thyme). Once the spices become fragrant, reduce the heat to medium and add the potato, fully coating the pieces in the spice mixture, then after about a minute add the kale. Mix the kale in fully and allow it to wilt before adding the chickpeas. Finally, add 1/2 cup vegetable stock or 1/2 cup water plus 1 tsp vegetable Better than Bouillon*, scraping the bottom of the pot thoroughly to pick up any fond and especially any starch from the potatoes. Cover and allow the stew to simmer for at least half an hour. You want the liquid to reduce substantially – it should almost completely absorb into the vegetables, but if it doesn’t by the time the potatoes and chickpeas are soft, uncover and allow the liquid to evaporate into a thick gravy. Taste for seasoning (depending on the stock you used you may need to add a lot of salt at the this point). Remove from the heat and allow to cool. *If you use Better than Bouillon you can get a much more concentrated stock flavor because you control how much liquid goes into the dish, but this also means more salt, so always under salt the dish until the end when using this stuff. I also like Better than Bouillon because it is more gelatinous than vegetable stock, so even the vegetarian dishes get a texture closer to chicken stock. In a large mixing bowl or the workbowl of a food processor, combine 1 1/2 cups white flour, 1/2 cup teff flour, and a pinch of salt. Add in 1 stick of very cold butter cut into cubes and pinch it in with your fingertips or pulse to combine, until the texture resembles small peas. Add 1 egg white (reserve the yolk for an egg wash later) and 2 tbsp ice water. Mix, either by pulsing in the food processor, stirring with a fork, or stirring with your fingers in a claw shape, until the mixture is well-incorporated and clinging together, but still slightly crumbly. If it is too crumbly to form a ball, add up to another 2 tbsp ice water. Wrap the dough in plastic and chill in the fridge for at least half an hour to allow the flour to absorb the water and even out the texture of the dough. Preheat the oven to 410*. It’s easiest to make each pie one at a time, especially if you don’t have a large counter surface (I have about 18″ square of workspace and I wouldn’t attempt to roll out all the dough at once unless I had about 3 feet). Divide the dough into 4 even pieces, dealing with one at a time. Very lightly flour your work surface (you need less than a tsp of flour). Press the piece of dough you are working with into roughly a cube, then start to roll it out. Start from the middle each time and only roll in one direction, then back to the middle and the opposite direction – this will help you control the spread of the dough, keep the shape regular, and keep the thickness consistent. You want a rectangle of about 8×10″, but there’s a lot of leeway here – it doesn’t need to be perfect, and you don’t need to trim the edges. If the edges split, pinch them back together and roll over them again to seal – this should happen less as the dough comes to room temperature, although if it is very hot or you are working slowly, keep the rest of the dough in the fridge so the butter doesn’t melt. The final thickness should be very thin – about 1/16″. Divide the filling into 4 even portions, about 3/4 cup each, and place one onto the right side of your dough rectangle and shape it into a block, leaving about 1/2″ from the edges. Fold the other half of the dough rectangle over it, smoothing the dough against the filling to ensure there is as little air as possible, and crimp the edges however you like to seal them – rolling the tines of a fork is an easy way to do it, but I like to roll the edge over and pinch. Move to a baking sheet lined with parchment paper or a baking mat (or, at the very least, lightly greased), and repeat with the other 3. Once all 4 pies are on the baking sheet, mix your reserved egg yolk with 1 tsp water or milk and brush generously over all the visible surface of the dough, especially getting into the crevices where the crimping is. Sprinkle with salt and herbs, then cut a few vents in the top of each one (I like to make 3 snips with a scissor at an angle). Bake at 410* for 45 minutes. Signs that the pies are baking well: about half way through you should see some liquid bubbling up through the vents, which should subside before they get to 40 minutes or so; the final crust should be browned and slightly crackled, noticeably puffed, and a little bit dryer and harder, but without any burnt spots and with a little bit of give still. Remove from the oven and transfer to a wire rack to cool (without the mat or paper underneath, because you need circulation all the way around the pies). Eat now as they are, at room temperature, or freeze wrapped in foil for later.